According to the American Society for Parenteral and Enteral Nutrition, many hospitalized patients in the United States receive inadequate nutrition, which can lead to higher infection rates, longer length of stay, and poor wound healing. Malnutrition Awareness Week is aimed at fighting those impacts and increasing optimal nutrition for patients. Malnutrition Awareness Week is intended to increase awareness of the problem by educating and providing resources to people who need to know. One of the greatest ways to generate more awareness is to use reminders. Silicone wristbands can be just the thing to raise funds for and to create talk value about Malnutrition Awareness Week. They can be customizable in any color, and they can have artwork and unique messaging. For example, the bands could say "Ask about your nutrition" or "Reduce malnutrition". For even more eye-catching appeal, the bands can be made with glitter or glow-in-the-dark effects. Many of our wristbands can be created with our easy-to-use online wristbands design tool. Or, call us and our professional and friendly customer service agents will help you. When purchasing custom wristbands online, be sure to work with a vendor who offers only 100% latex-free wristbands. At Amazing Wristbands, all our silicone products are non-allergenic and latex-free. We offer free shipping, free artwork, free design, and free color matching. There are no minimum order requirements on our most popular wristband styles, and your custom bands will ship within 5 to 10 days. 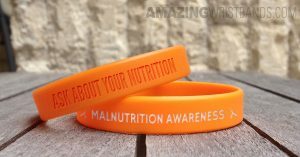 Build your own Malnutrition Awareness wristbands online today!